Linderhof is quiet this afternoon as the company have left. The tables are cleared, the dishes are stacked and waiting to be washed. And I'm enjoying a little "quiet time". For I had 3 for lunch yesterday, another couple for dinner last night and eight lady friends for lunch today. It's been a busy couple of days at Linderhof! But it's Christmas and we love to entertain and sometimes in the hustle and bustle of the season, free dates seem to stack up. Eight friends joined me for lunch today. A simple lunch, served buffet style, thus instead of one big table in the dining room we sat half in the dining room and half in the breakfast room. Who sat where? They drew numbers so no one would feel like they were at the "Siberian Table". 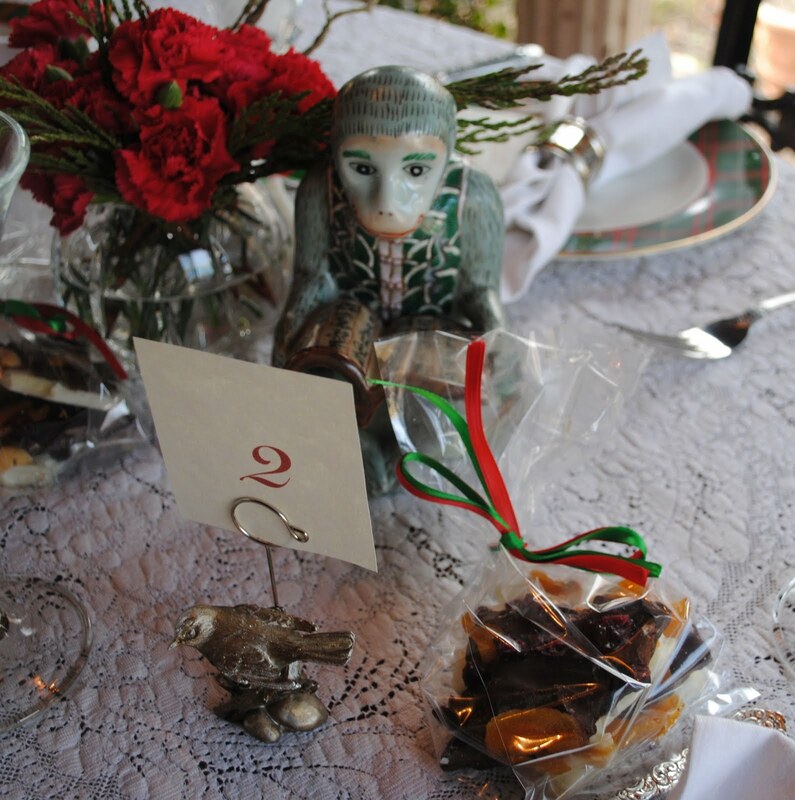 I used similar linens and centerpieces for each table. The dining room table with it's lace cloth -- an old one belonging to my mother. 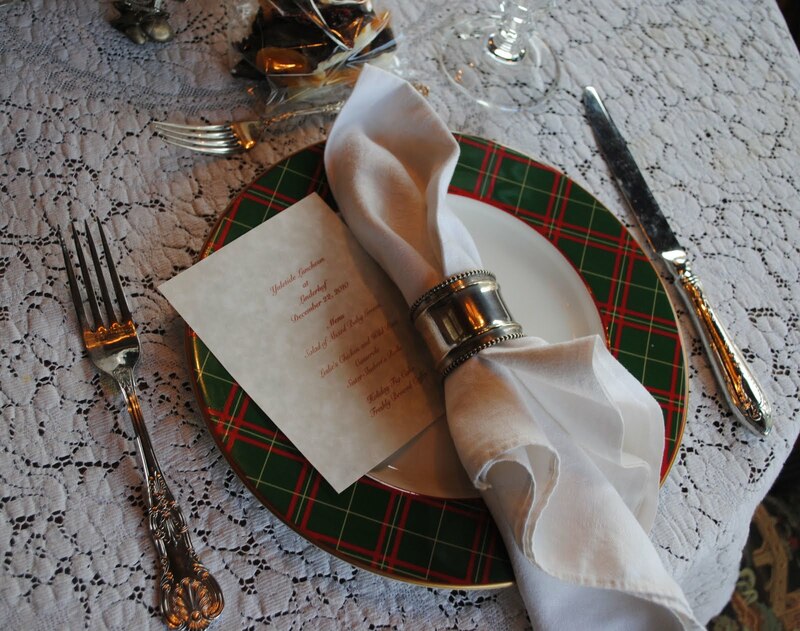 White damask napkins in silver rings and a centerpiece of red carnations with Christmas greens. The silver coffee service waiting for dessert. 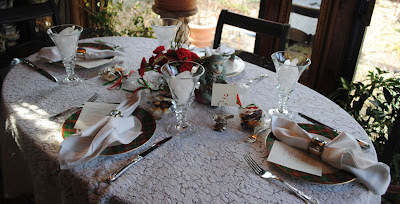 The table in the breakfast room with it's lace cloth and bowl of red carnations and Christmas greenery. With a surprise -- a little monkey a Christmas gift from the Lunch Bunch yesterday -- and I thought he looked so perfect on the table! Each place was set with a Royal Doulton Tartan plate, a fork and knife, a damask napkin in a silver ring and a menu as well as a bag of French chocolate bark and white chocolate bark tied with red and green ribbon -- a favor for my guest to take home. 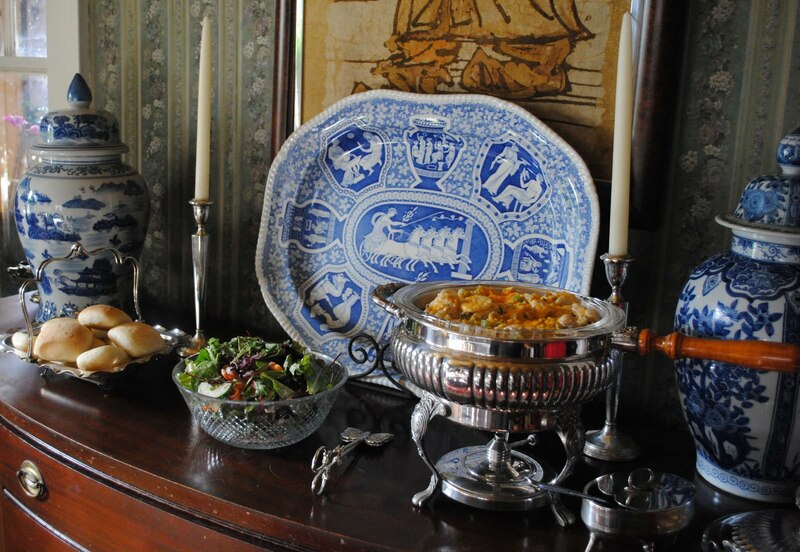 The Williamsburg tilt-top table with dessert! 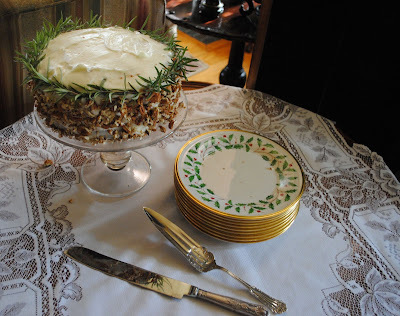 Topped with a favorite small lace tea cloth, this table was perfect for holding the luncheon dessert which was a Holiday Fig Cake with honey cream cheese frosting decorated with pecans and fresh rosemary. Carols are still playing softly and the tree is lit. It's Christmas at Linderhof and I've baking yet to do! But I do so enjoy my company and we had a great time. With wishes of Merry Christmas they left with a flurry of hugs and a "see you after the holidays". 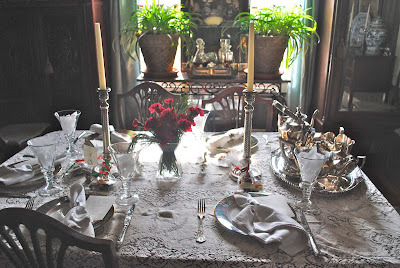 It's Thursday and time to share our Tablescapes -- so please join Susan at Between Naps on the Porch to see what other holiday tables there will be today! I can only imagine the joy and laughter that surrounded those elegantly set tables at Linderhof! Now it's time to get serious about your own family celebration . . .for Sarah is coming home. Home to Linderhof, dad and, to you! Enjoy, dear friend. I would be honored to sit and dine anywhere in your beautiful home. And, as I see, you made sure all the place settings were just perfect. You have been such an inspiration to make dining a beautiful experience. I'm planning to do it all up for Christmas Eve supper. It'll just be my hubby and me (as is our custom) but he deserves the best. Merry Christmas. Your tables are very inviting and so well bedecked, it would be an honor to sit at either one.. The menu sound yummy and the dessert looks absolutely scrumptious. Merry Christmas! I'm sure your friends were delighted to sit at either table. Love the rosemary and your individual place settings look perfect for the season. Thank you so much for sharing and Merry Christmas. I wonder if your fig cake is like the one we make here in Alabama. We'll have to compare notes! What a fabulous idea to have guests draw numbers so that no one is left feeling "out in the cold." I LIKE it!!! I may have to use that very same idea someday! You really HAVE been busy around there, and I hope you have a chance to kick back and cool your heels for the remainder of the week. Have a happy, happy Christmas! Oh....LOVE the monkey! How lovely your Linderhof lace laden tables are. Love your little monkey guest. Perfectly beautiful. That is so like a Victorian tea. Just beautiful and the cake looks delicious. Merry Christmas. Your tables are beautiful as always and I am sure your friends had a wonderful time. What a beautiful setting and table! What a privilege to be at your table, your friends must say. Beautiful, Martha! I would covet an invitation to your table. A very merry Christmas and good wishes for the new year. Your table is just lovely. 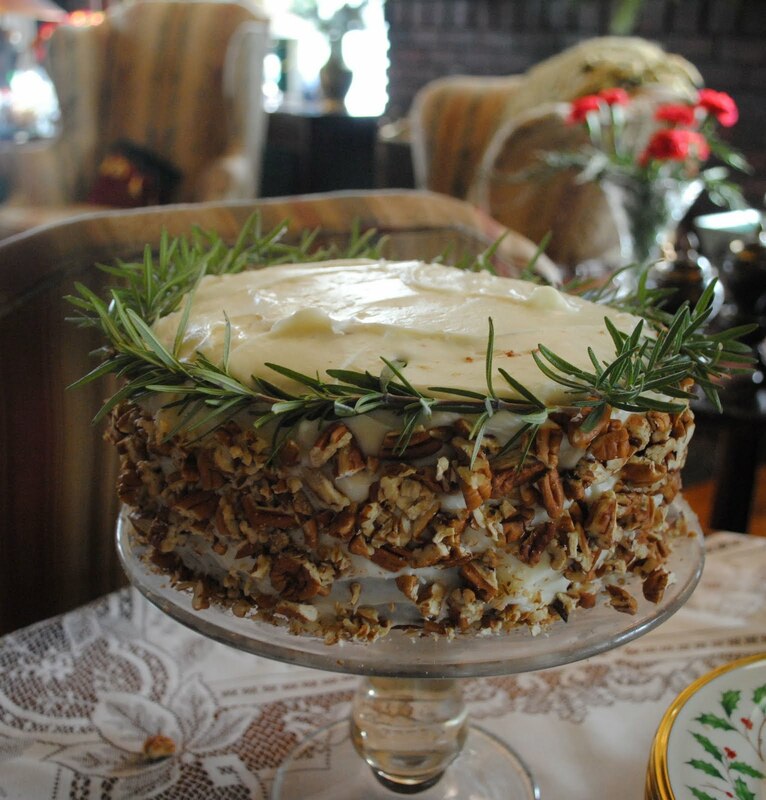 I love that cake with the rosemary too. That's really different. I know that your "lunch bunch" had a grand time. Wishing you a very merry Christmas from my table to yours. The table looks so elegant. Love your cloth and the monkey especially but everything is beautiful. My best for a wonderful holiday. Martha....what can I say except everything looks beautiful in your home. 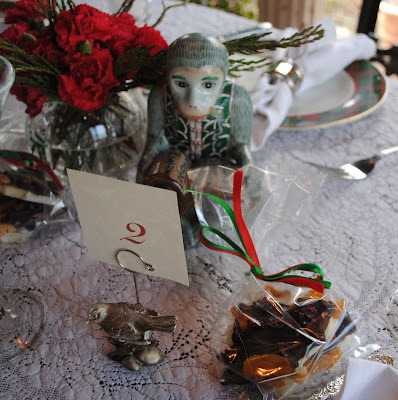 It looks so inviting and festive...... love the monkey. Merry Christmas! Martha, Everything is so beautiful and festive. I know your guests had a wonderful time. The fig cake looks soooo good. Seems you are doing well with your knees, don't overdo it. I have been struggling with time management this year. Not knowing how to work the blogging in with my holiday schedule. I will have it worked out by next year. As usual, beautifully done, Martha and I bet enjoyed by everyone invited! Merry Christmas to you and your family, Martha. It's all beautiful, Martha. You must be enjoying your Christmas so, with the surgeries behind you it's surely pure enjoyment this year. I especially love the decoration of the cake - so festive!